To aid in preparation, the Complete 1 Year Curriculum Guide includes a detailed Items Needed list..
Philippians 2:3 (NIV) - Do nothing out of selfish ambition or vain conceit. Rather, in humility value others above yourselves. Taking Care of Me: Where are my eyes? - ABC Book: Paint the arrow on the Down worksheet red. - When reading the story, sign "down" when the giant falls down. Color Train - Add a red train to your Color Train by having the child color, with a jumbo crayon, the red train. Display the train at the child's level to point and discuss the colors. Using red construction paper, cut out a large triangle. Using minimal water, have the child water paint the triangle. Talk about the shape as the child paints. - Using the Dog worksheet, point to the dog's eyes. - Drop a few dots of red paint on the Dog worksheet. Let the child spread the paint with a cotton swab. - Clifford (books and TV program) is a great example of a red dog. - Point and count the dog's legs. - Find pictures of dogs in the books that you read. - Crawl around on the floor and "bark" and "woof" like a dog. - Name the animals in the illustrations and say the sounds the animals make, specifically point out the dogs and pigs. - Find objects that are red (barn). Helping in the kitchen is a wonderful fine motor activity for children, beyond the time together it provides. 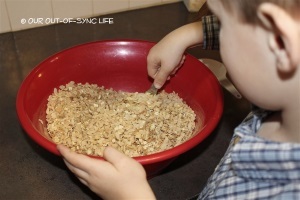 Allow your child to assist by helping you stir, pour, unwrap, and shake. Placing a damp cloth under a bowl helps keep it from slipping. This week make muffins and allow the child to help stir the ingredients. Be sure to count as you add the ingredients (e.g. 1 egg, 2 eggs, 3 eggs). Here's one of our favorite recipes - Refrigerator Raisin Bran Muffins. Bubble Fun - Blow bubble and encourage the child to catch, step on, and pop the bubbles as they float to the ground. Bubbles are fun in the bathtub too (make sure the child is sitting down).